I have three children. The one thing they all have in common is how much they enjoy spending time with us. I know I am going to capitalize on that for as long as possible. We try each weekend to spend most of the day enjoying one another. We go to the pool on Saturday, and we play basketball on Sunday depending on the weather. We have a blast laughing and trying to score the perfect basket. These days with my kids get older I find myself looking for activities that they can all enjoy. I know have two kids that play basketball on teams, and we love to encourage their passion. We find that keeping your children active and finding something they enjoy is the key to success. We love to find activities that encourage teamwork and hard work. I was over the moon when I saw that the Harlem Globetrotters were coming to my town. The reason is simple I went to a show when I was a little girl. I can't tell you when but I do remember the time I spent with my dad and how awesome the experience was. I know all I said the whole time was "WOW! Did you see that?" I know that family-friendly activities are an important component in developing a deep understanding of who our children are. It helps us get to know them and be able to meet their needs so they can be successful. I am also very selfish, and I want to spend as much time as I can with them. I know that the Harlem Globetrotters are a slam dunk in my heart and soon will be in my children's. The show was jam-packed full of funny antics, jokes, and basketball skills that I can only dream of completing. The Harlem Globetrotters did their best to get everyone involved in their show. You aren't just there to watch, but you are encouraged to become a player. The Harlem Globetrotters love seeing families laugh together during our games, and would love to see your family when they come to a city near you. If you're looking for an awesome event the whole family will enjoy, see if the Harlem Globetrotters are coming to an area near you. This is the Harlem Globetrotters Schedule. Do not forget if you buy team merchandise that after the game, Globetrotters will stay on the court to sign autographs and take photographs with your kids. The only thing better than finding an event the whole family will enjoy is getting a great deal on it. Save 25% per ticket* by using the promo code "FAMFUN." Get ready to experience a show your family will remember for a lifetime! *Discount available on select ticket levels. This is what your children will look like when they have to leave. I let them know we can go again next year! This is an excellent gift for the holiday, birthday, or having good grades. It is a reward for the child and the whole family. I am pretty sure my husband and I had more fun than the kids! 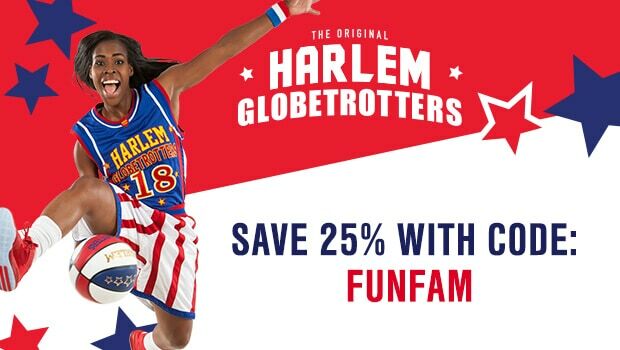 Pick up your discount Harlem Globetrotters coupon now so you too can Review the Harlem Globetrotters.